The Scallop 1 September 2006. © Tim Elliot and licensed for reuse under a Creative Commons Licence. 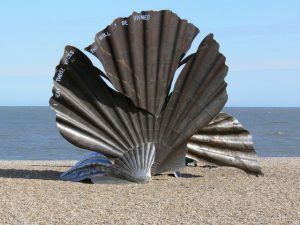 Artist and sculptor Maggi Hambling‘s 4m high tribute to composer Benjamin Britten was unveiled on Aldeburgh beach at 12 noon on Saturday, November 8, 2003. The sculpture has divided opinions, with calls for it to be moved, and it has been vandalised on a number of occasions. 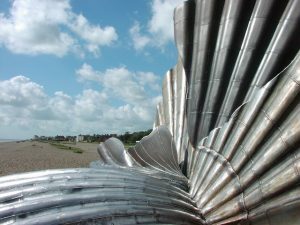 The Scallop with Aldeburgh in the background, August 2005. ©Mel Darke and licensed for reuse under a Creative Commons Licence.